The discovery of a new species of rock gecko with round pupils occurred in Lampung. Awal Riyanto, a reptile expert from the Indonesian Institute of Sciences (Lembaga Ilmu Pengetahuan Indonesia/LIPI) discovered a new species of rock gecko named 'Cnemaspis Rajabasa,' its name according to the name of the mountain where the gecko was found. The rock gecko with round pupils were active at night. Awal's research based, along with several other researchers such as Thasun Amarasinghe, a herpetology expert from the University of Indonesia, Michael Harvey of Broward College, and Eric Smith of the University of Texas, it is known that the gecko lives in the granite rocks. The characteristics that distinguish Cnemaspis Rajabasa of another species in Cnemaspis family, such as adult body size reached 58.7 millimeters, labial scales above 13 or 14, under the labial scales 11 or 12, tricarinate shaped belly scales, have holes or pores precloacal, backs with jinjot tubercular randomly scattered, tubercular surrounds the tail, the tail scales at the bottom of the rough (keeled) and ranks in the middle without enlarged scales on each side have two lumps on postcloacal tubercular and the tail has a striped pattern of dark-light. Awal says, very little of Cnemaspis species found in Indonesia. 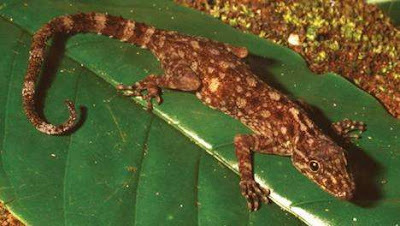 Most geckos of the genus are found in Vietnam, Cambodia, Laos, Thailand, Malaysia, and Singapore, as well as small islands around Malaysia Peninsular. "Therefore, the findings Cnemaspis Rajabasa is very important and meaningful," said Awal as told to CNN Indonesia. Awal said further, the findings increase knowledge about the distribution of Cnemaspis to the west and south. In addition, still need to be investigated whether this gecko also reach northern Sumatra or even cross over to the island of Java.